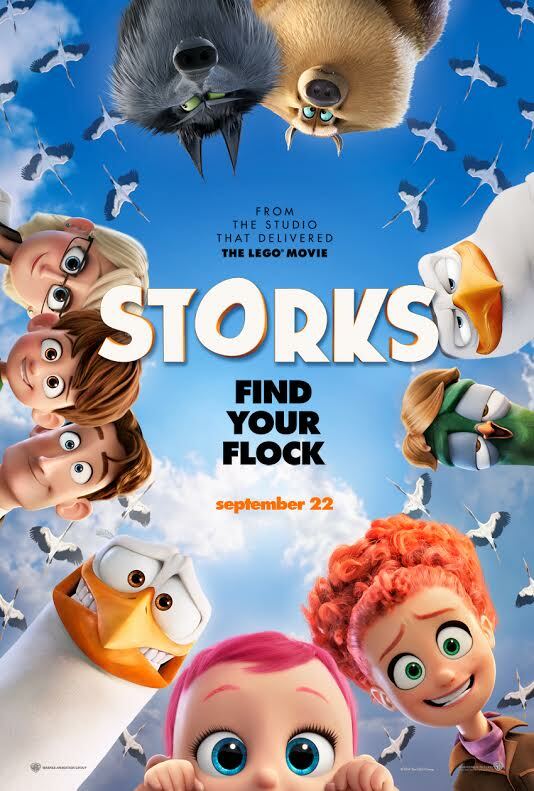 The latest computer generated entertainment product created to separate parents from their money, preferably with an extra 3D surcharge on each ticket, is STORKS. The premise is that once upon a time, Storks really did deliver babies. As it turns out, though, there's a lot more profit to be made by delivering household goods. And so the birds got out of the baby business and started an online shopping juggernaut called Cornerstore.com. Humans, evidently, now being left to procreate the old fashioned way. There's one constant reminder of the birds' prior occupation, though: Tulip (Katie Crown) was a baby whose Stork got too attached to her and, while trying to keep her for himself, lost her delivery information. She's been living in the Cornerstore Warehouse, doing her best to help out. But now that she's turned 18, CEO Hunter (Kelsey Gramer) wants her gone. He delegates this task to Junior (Andy Samberg), promising him a promotion if he's successful. But the ambitious bird can't go through with it, and instead tries to hide Tulip in the old baby factory under the pretense of giving her a job in the mail room. Of course this doesn't work out quite as planned. Tulip accidentally starts up the baby making machine, resulting in the birth/creation of a magenta haired baby girl. Junior has to cover up his mistake, and reluctantly teams up with Tulip to do so. Shenanigans ensue. Look, I have a five-year-old. Even if I didn't have to review STORKS, I'd still have to see it. Most likely more than once. And it isn't going to get any better with repeat viewings. If you don't have kids, and/or your emotional development didn't stall at age 10, there is no reason for you to ever watch this movie. Pixar it ain't. If you do have kids, they'll probably want to see this slab of mediocrity. They'll probably enjoy it, too. But come on; if your kids are anything like mine, they can probably sit and watch toy surprise egg videos and clips of loud British guys playing Minecraft all day long. Their standards aren't that high. So what the hell, take 'em to see it. Just try to get to a 2D screening so you can save a few bucks. The 3D in this one is completely lackluster. But as you're sitting in the theater with your progeny watching STORKS unfold, your adult brain will very likely nag at you with questions about the poorly conceived world the filmmakers have created here. Like, if babies were all produced in a factory and delivered by storks at one point, were there no pregnancies at that time? Did traditional human reproduction only begin when the storks got out of the baby business? In lieu of actual entertainment provided by the movie itself, these are the paths my mind wanders down. 2 out of 4 stars.